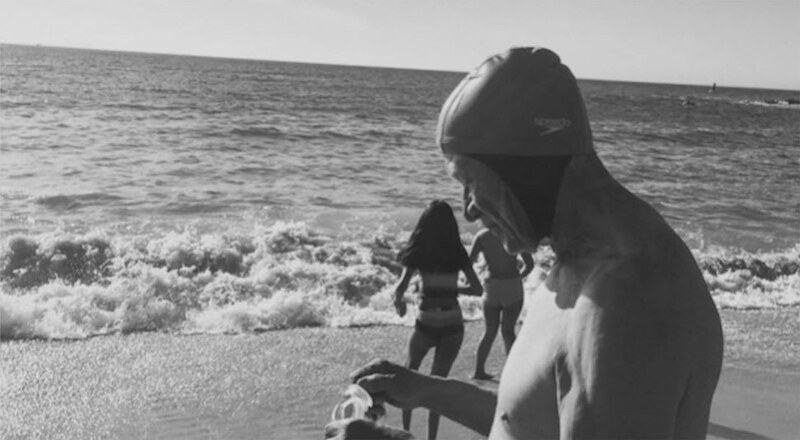 After a big slap from his doctor and the excesses, at age 60 he changed his habits and began to train with a group of triathletes. At 63, he was already a national champion in his category. 5:00 pm in Caleta Abarca, Chile. Enthusiasts are seen with the arrival of spring enjoying the sea. 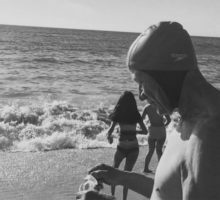 Couples of lovers and seagulls accompany this meeting with Virgilio Ruilova, an 80 years old man who arrived as every Thursday to swim in the popular beach after his working day as a medical visitor. From Monday to Friday he wakes up at 6:30; at 7 he is taking breakfast and before 8 o'clock starting to work in hospitals and medical consultations until lunch time. Sometimes he eats in the city, otherwise he goes back to his house in Recreo, Viña del Mar. Then he continues working until 6 in the afternoon. When it reaches the sun, it gets to swim to the beach on weekdays. His next goal is to cross the Chacao Canal in southern Chile next October, although he has already made this crossing twice. 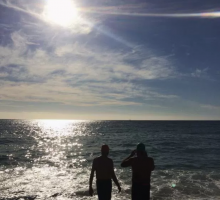 It is a normal day of "Great Virgil", as his teammates of the open water swim club call him. -Look, it happens that I led a very disorderly life. I was a traveling salesman. I'm still on it, but I do not travel anymore. Virgilio tells that the traveling salesman is full of stories and many positive anecdotes, but drags a permanent regret, specially because of his family. He was traveling 3 years from Temuco to Punta Arenas while he was living in Santiago, so he appeared only twice a month for his house, which consequently brought him a lot of junk, cigarettes and alcohol. He drowned his sorrows there with his companions during travels. Each salesman with his tragedy. It was then that he reached 96 kilos of weight with a ferocious dyslipidemia. Reaching an age that one would expect to be soon to retire, from a traveling salesman he became a medical visitor. At 58 he was working in a medical consultation when he had a heart attack. If he had not been there, the situation today would be different. He was hospitalized for 3 days and on the way out he got the best slap in his life: "How is it possible that you leave this place with nicotine smell? How is it possible that you are killing yourself in this way? But the worst: how is it possible that you are killing your family? " The doctor told my wife that the passive smoker is the most ill-fated. Along with that, he ordered him to throw all the cigarettes out of the house. Smokers often try to hid the cigarettes in the bed, in the furniture, in the bathroom. I had to throw them all away. "And if Virgilio gets angry with you, I'll settle with him." He almost hit me. Virgilio had to follow a healthy mediterranean diet. It was the only way. He had to try to save himself and his children and took a medication every 12 hours. They told him to come back in a month, if he was still alive. He just got a transfer to the coast city of Viña del Mar. He had asked for it three years ago and they gave it to him the week after that ultimatum. 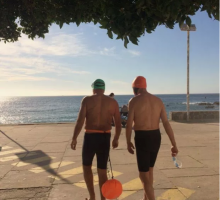 Already in Viña, he went to work at the doctor's office Sergio Fuentes, who is a great triathlete, but so far Virgilio did not know. In the office there was an old man like him, in his sixties. He said: "Virgilio, why do not you play sports? Sports will keep you away from bad habits, it will improve your life ". And he invited him to train with a group of triathletes. Did you play sports before? - I laughed and I answered "but, how? I do not know how to jog, the closest thing to a bicycle in what I have been riding has been a tricycle, and in the water I just babble." Then the old man next to me said "Virgilio ... it's all about learning. We both are two old men. Let's go swimming". He advice me to start swimming in a heated pool from 9 to 10 at night and that suited me. At that time I was not working and I was very tired, so swimming in warm water was excellent. They began to train, and as if he was not exaggerating, Virgilio says that the triathletes looked like fast boats alongside them. 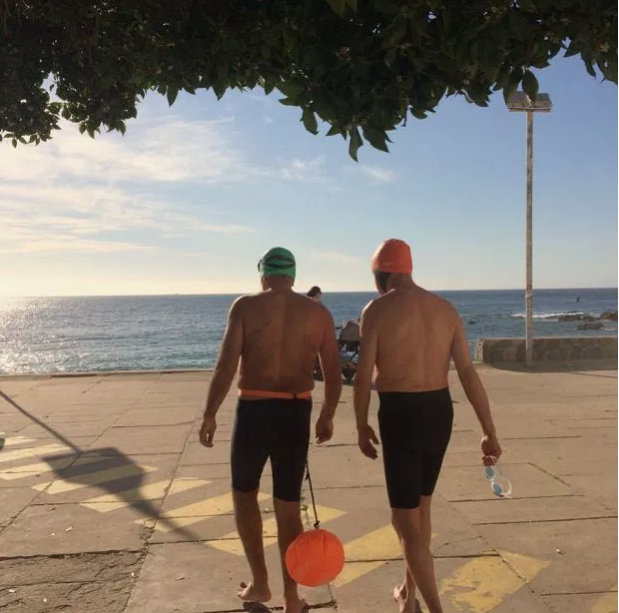 With the other old man they started talking about politics, sports, art, until the pool coach told them that the pair of old people either get to train or leave, because they were a shame. And they began to train, but this time seriously. "The moral is that when doing sports you have to be well advised. That is quality of life. I improved my health with sports, but it worsened my quality of life in the sense that it left me with problems to my bones and I can no longer ride a bicycle, for example." At 60 I had already dropped from 96 kilos to 72. I did not smoke anymore, naturally stopped drinking, and keep on the mediterranean diet that I still have to this day. I felt very good. During that days I made my first triathlon. Just three years after he began to play sports, he was the national champion of his category. 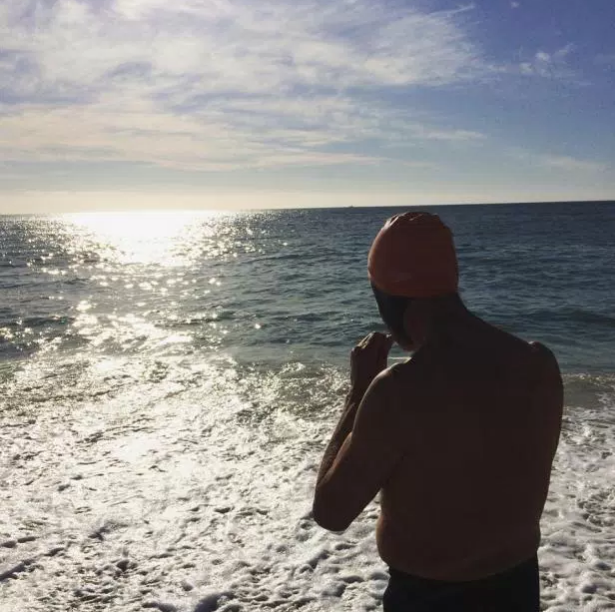 At 65 he crossed the Chacao Channel with the mythical chilean swimmer of open waters Victor "Tiburón" Contreras, who taught him to swim in the sea. On that occasion he was accompanied by his son Daniel, who was 12. They were 11 children that day and they did it only with a bathing suit, with about 6 degrees of temperature. Did you encourage your child to swim and sports? - I encouraged him and he was motivated. At 8 years old he made his first triathlon. Virgilio stopped running triathlon. He reveals that his past bad habits passed the bill. Today he is suffering from knee problems due to osteoarthritis. -Curiously I take a shower with hot water once a week, but I prefer the seawater. I read what a Spanish doctor who recently came to give talks about the benefits of seawater exposed me and made sense to me. A scientist said that if the sea water were harmful, there would be no animal or plant life there. Tell me about your most exciting achievements in swimming. - The Strait of Magellan, which meant a tremendous challenge. I was 70 years old. And the Laguna del Inca next to Los Andes, for the height and the cold. There we were swimming surrounded by snow. 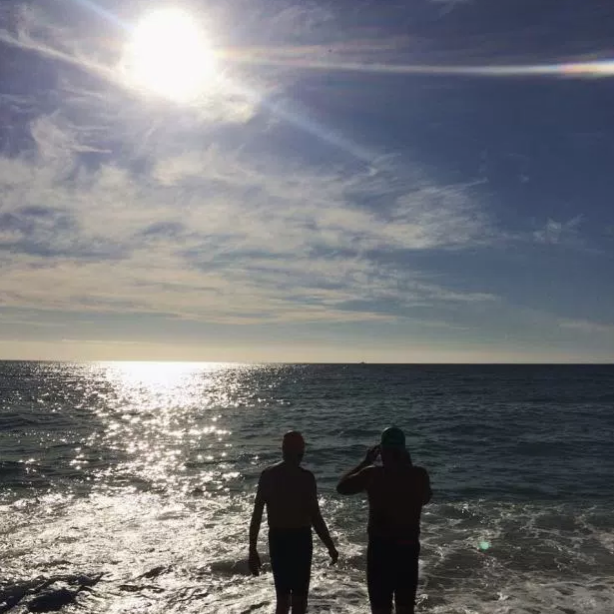 We did the round trip with other swimmers and friends. We had a good team. The last one we were preparing for was Lake Titicaca. The crossing of Titicaca was extraordinary because it was international. - Yes, I was about 3 hours with 55 minutes swimming. Any anecdote related to the crossings? - In the great crossings that I have done, I have been in all without guide boat. And since I'm short-sighted, I do not see and have to delegate a lot, so I've swam a lot more than I should. It has happened to me in the Strait, the Chacao Channel and the Titicaca. Have you ever been unable to reach the goal? I always reach the goal. But there was a crossing in the Chacao Channel, maybe the last year, which we could not made the crossing. They took us out of the water due to weather conditions. I wanted to continue, but the start was not at the right moment and the current started to deviate us a lot. We were 204 swimmers and 6 managed to cross, but because they were holding on to a boat. Have you had any special recognition? Any more emotional? - I went to Peru awarded by the laboratory where I work. I went just for enjoyment and to have a break, but the manager there wanted me to talk about my achievements and what I do. He was struck by what I was doing: that at 60 I could change my mind. When there is a will, there is a way. - The sea allows us to live fully while we live, as long as we feel like it. I swim because it saved my life. I could change my mind. It is always possible Suddenly one thinks "no", but feeling old is only on your head. 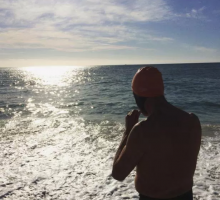 "When I swim, I take two or three puffs of water. I feel very well in the sea. You have to know it and know how to read it. For several reasons I stopped jogging, but the sea, as long as you do not have an invalidating illness, will always receive you. The sea is very noble."